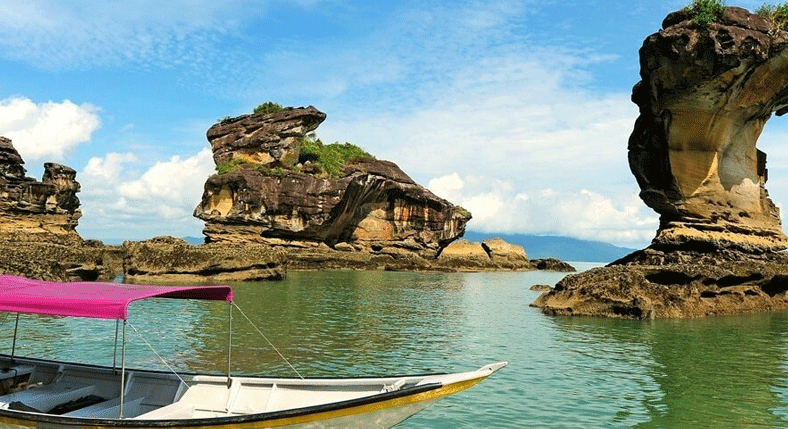 Bako National Park is the oldest yet smallest national park in Sarawak, Malaysia. 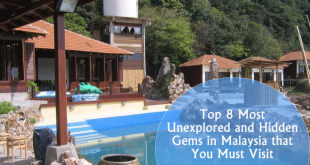 It is located just 37 km from Kuching and is very easy to reach for the tourists. The major highlights of the national park are probosci’s monkeys. 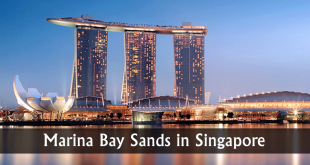 It also has complete ecosystems like heath forest, beach vegetation, cliff vegetation, grasslands vegetation, mangrove forests, peat swamp forests, and mixed dipterocarp forest. It is a cool and amazing way to enter the national park. You can reach the center of the park only by sailing on the Santubong River with its breathtaking scenery. You can also find saltwater crocodiles which live in the rivers and mangroves. There are total 16 trails in Bako National park in different distances and difficulty levels. You need to complete each of the trails in 3.5 hours. But Bukit Gondol needs 4.5 hours, Telok Kruin takes 7.5 hours and Telok Limau takes 7 hours to complete. These are some of the longest trails in the national park. You can enjoy various flora and exotic vegetation during the trails, such as beaches and waterfalls in some places. You should get to know about the trails before you explore, including the entrance fee at the Bako National Park. For the trails finishing on the beautiful beaches, you may want to book a boat pickup. If you plan to enjoy swimming, snorkeling or any other activities or you love beaches, you can have fun at the Bako National Park. Along with it, you can also enjoy the tranquil and beautiful beaches on a small island, Lake Island located in the north. You need to rent a boat to get there. 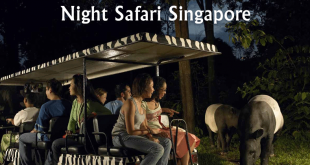 You can also get more exciting experiences through a night walk and watch the nocturnal wildlife at the headquarters of the park. You don’t have to worry about accommodation here. There are so many accommodation options available here. 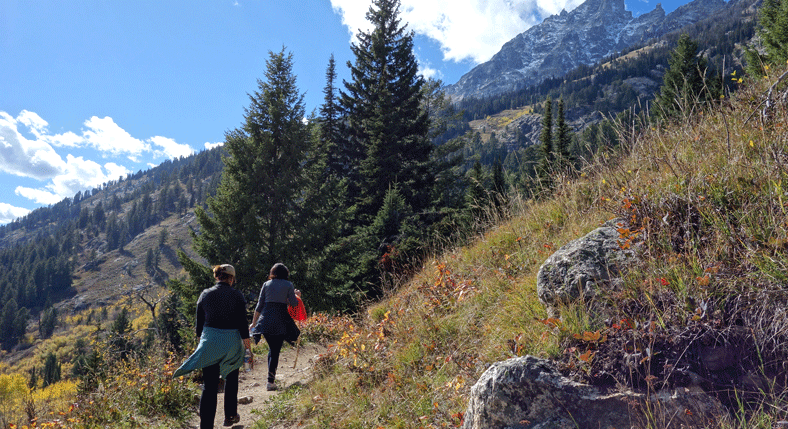 You may prefer to stay overnight in the lodge if you want to explore the trail in a longer time. The rent is also very affordable. You can book the lodge with dorm room bed which costs up to RM20 per night and a private cabin costs RM157.50 for two guests. You need to travel to Bako village first by taking a taxi to reach Bako National Park from Kuching. You can buy the ticket at RM35 at Kuching Airport taxi counter. You can also take Petra Jaya bus No. 6 (which takes the longest time but cheapest, RM3) or minibus (which is a little faster than the bus but little costlier). Then, take a boat (which consists of 5 passengers and charges RM47) for up to 30 minutes to get to park headquarters. The entrance fee in Bako National Park is RM10. If you love to explore the wildlife and exotic nature, Bako National Park is the best destination for you. Kuching Airport is the nearest airport to the park. Bako National Park is actually an island, well known for macaques, Proboscis monkey, bearded pigs and plenty of wildlife and bird species. To experience the unique mountain and jungle adventures, you may book homestay and trekking tours. A lot of these tours are culturally designed for tourists. The tour gets most realistic to the travelers where you can get a complete insight into the tribal setting and wilderness. Southeast Asia and Asia have large numbers of monkey parks and temples. But you will get to experience the real safari experience and spot the wildlife closely at this national park. You will get to roam freely to have the actual wildlife experience. Here, the wildlife seems to be familiar to the travelers who are watching them. 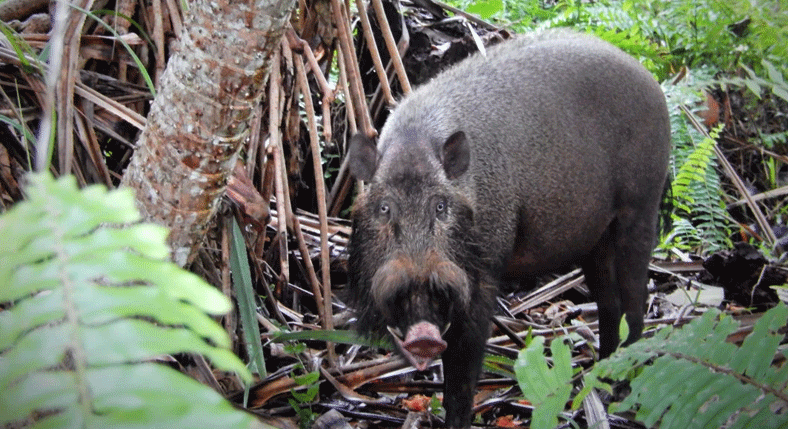 You can even find some bearded boars sleeping near your dining hall. With its forests and beaches, the island park is a feeding ground for them and you may also find them playing or fighting each other. 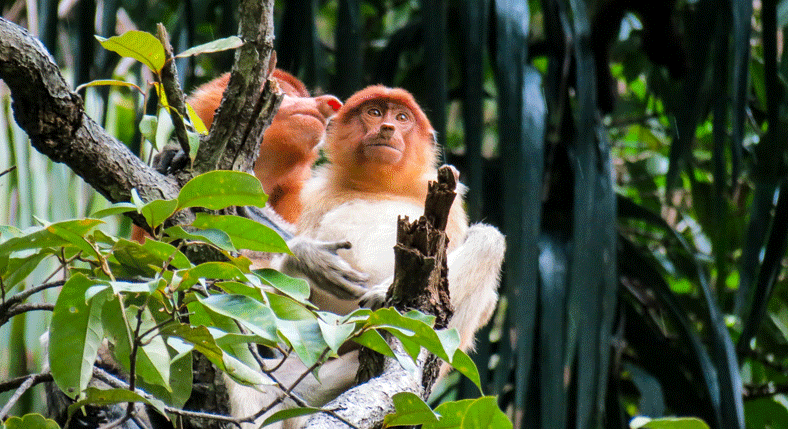 The Proboscis Monkeys are the star attractions in Bako Island and endangered species in Borneo. 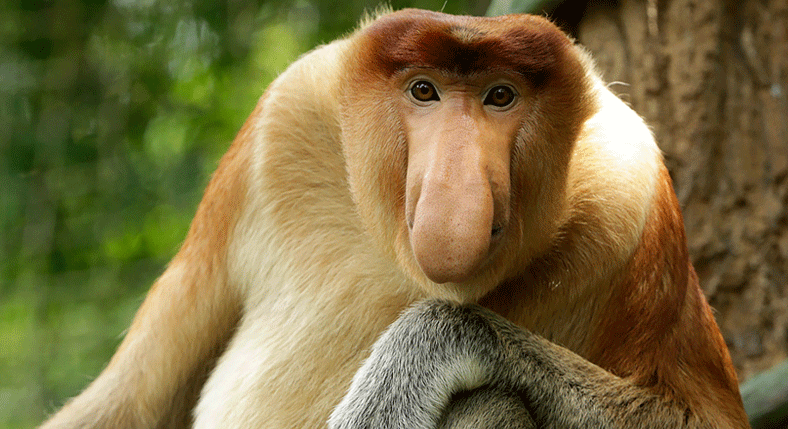 These monkeys are known for their unique bulbous noses and they are very rare of their kind. They are protected on this island and they can freely live and eat here. But it is not sure you can spot them. Usually, they come out to feed during early morning or late afternoon. There are 18 hiking trails in Bako National park, from easy to challenging. Most of them take only 3 hours to complete and they are coded with colors for travelers. You can take these trails to get you through the waterfalls, jungles, mangroves, and serene beaches. The scenery starts to change during the trip from gorgeous to picturesque and surreal. Some beaches have saltwater crocodiles, so they are dangerous to swim in. if you want to splash, be sure to ask the park office about the safe beaches. Be sure to pick a free map of trails and lodges and park grounds when you get here. The island offers astonishing and surreal beauty and varied terrain which gets you through mangroves in wetlands, secluded beaches, low and high tides giving you the insight to the sea level. Low tide can be the best time as you walk through the beaches and watch hermit crabs and cockles that come out under the feet. The island has a lot of photogenic opportunities to capture the natural beauty that you have never seen before. There is no lack of surreal views of landscapes to capture for your Instagram. Be sure to carry sunscreen and a bottle of water with you. It can get hot and you can feel the jungle often getting as humid as the forests in Amazon. Some wildlife and animals awake at night and there is nothing more exciting than playing hide and seek with them through a guided tour. There is a chance to see some of the night creatures. The park guides will take you through bridged trail and point their flashlights to nocturnal reptiles, insects, and animals.